February was a very active month for me as I traveled to several birding locations in search of as many species as possible. Visited Wakodahatchee Wetlands and Storm Water Treatment 1W in Palm Beach County where I had Purple Swamphens and a Purple Gallinule. Also King Rail, Swamp Sparrows, Savannah Sparrows, Painted Buntings, American White Pelicans, Ruddy Ducks, Blue-winged Teal and lots of American Coots and Common Gallinules. Went to Wakodahatchee to find the neo-tropical cormorants nesting there. Dipped on the neo-tropical, but saw the many nesting. Double-crested Cormorants, Anhingas and Great Blue Herons. Large iguanas were seen in several places. On Presidents Day I attended a guided tour at Storm Water Treatment #5 south of Clewiston. On an earlier date a stop at the Okeechobee Dike Park located in Clewiston, I located a trio of Bronzed Cowbirds mixed in with feeding flocks of Starlings and Brown headed Cowbirds. Black Skimmers. A wintering Tropical Kingbird was a star attraction. Western Kingbirds and Scissor-tailed Flycatchers occupied roosts just outside of the venue. A cassin's and a gray kingbird were sometimes seen at the kingbird roost. Waterfowl included a many American White Pelicans, Blue-wing Teal, Northern Shovelers, Ring-necked Ducks and a few American Wigeons, Green-wing Teal, a Ruddy Duck and another star attraction in a male Cinnamon Teal. A surprisingly low count of only two Fulvous Whistling Ducks were seen and zero Black-bellied Whistling Ducks. On a trip up to Gainesville, made a stop at Four Mile Grade Road west of Arcadia to relocate a wintering Say's Phoebe. At another stop at Jenkins's Creek Park in Hernando County to locate the reported female Brewer's Blackbird, But missed budgies at Hernando Beach. There is speculation the they maybe extirpated there. Possible pressure from House Sparrows, House Finches and Starlings probably is the cause for there disappearance. White-winged doves, Red-headed Woodpeckers, Cooper's Hawk, a Merlin, American Kestrels, Eastern Towhees and Eastern Bluebirds. Also in Lehigh Acres is Harns Marsh were we located Snail Kites, Limpkins and Northern Harriers. A Dickcissel has been a star attraction at the bird feeders at the home of master birder Vince McGrath. Vince was also responsible for locating a Salt Marsh Sparrow at the Bunche Beach Salt Flats. In Cape Coral we have a family of Florida Scrub Jays, a colony of Monk Parakeets and many Burrowing Owls. Plus a wintering Eurasian Wigeon hanging-out with a flock of Mottled and Muscovy Ducks. A good sized flock of Nanday Parakeets can be found in Ft Myers. Down in Naples I located a reported pair of nesting Rose-ringed Parakeets. At the Sanibel Causeway another star attraction has been a wintering female Common Eider. Other wintering birds there included Red-breasted Mergansers, Common Loon, Black Scoters, Lesser Black-backed Gulls, Great Black-backed Gulls and Magnificent Frigatebirds. In a search for Northern Gannets I visited Turner Beach on Captiva Island were I was lucky in located four birds busy fishing along side Brown Pelicans and Double-crested Cormorants. It was a busy month and I got to see a lot of birds. E-bird buts my count at 175. On January 24th, Thomas Wymelenberg, posted on a local birding site concerning a reliable site to find Western Kingbirds. Several of us have now made numerous trips to Church Road in Hendry County and have found it to be a birding hot spot. Not just the western kingbirds, but Scissor-tailed Flycatchers too. We have also tally many Crested Caracaras ( I had 15 on this road on my first visit ), American Kestrels, Painted Buntings, Eastern Towhees, Wild Turkeys, American Robins, Northern Waterthrush, Wood Storks, American White Pelicans ( fly over ), Northern Rough-winged Swallows. 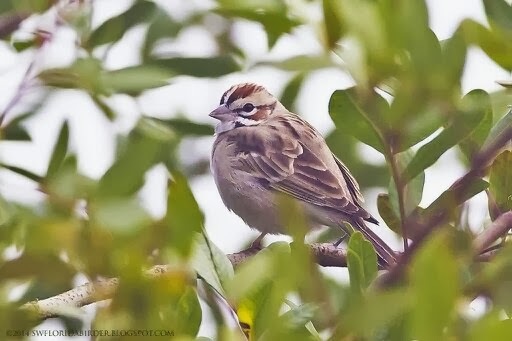 Off special note were a pair of Lark Sparrows, first located here by Vince McGrath and Photographed by Bob Pelkey. I was lucky to relocate the lark sparrows, plus Savannah Sparrows and an unexpected Field Sparrow.